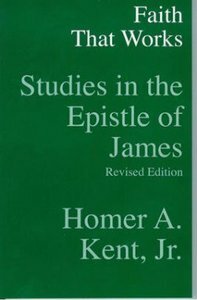 - Publisher This installment of The Kent Collection is an excellent tool for discovering the intensely human aspect of James' epistle. Discussion questions after each of its 13 chapters enhance its usefulness. About "Faith That Works: Studies in the Epistle of James"
This installment of The Kent Collection is an excellent tool for discovering the intensely human aspect of James' epistle. Discussion questions after each of its 13 chapters enhance its usefulness. Homer Kent has now retired, after serving at Grace Theological Seminary, Winona Lake, IN, for fifty years as professor of Greek and New Testament (1949-99), dean of the seminary (1962-76), and president of the college and seminary (1976-86). He continues to be active in Bible conference ministry, as a visiting lecturer, and in church ministries.